Discover the next generation of taps when you browse our fantastic collection of Insinkerator boiling water taps. Imagine never having to wait for the kettle to boil for your fresh cuppa, or being able to plunge pasta straight into filtered boiling water at the pull of a lever. Insinkerator hot taps allow you to do all this and more, and you can now buy them in the Insinkerator hot water taps sale at HC Supplies. Soon, all homes will have kitchen boiling water taps, but not all will boast Insinkerator steaming hot water taps. The Insinkerator tap is a superb example of a high end kitchen accessory that will propel your home into the future of modern appliances. Enjoy having filtered hot water in a moment, in addition to the expected hot and cold water supply. Insinkerator hot water models are available in an assortment of different colours, allowing homeowners to match the taps with their chosen decor. Select striking orange, muted natural stone, or opt for the stylish chrome Insinkerator tap. Take a closer look at all the Insinkerator taps in our designer taps sale, and grab a great deal today. The Insinkerator boiling water tap is an innovative creation which combines style and practicality in one amazing kitchen accessory. You may have been searching for the brand using www.insinkerator.co.uk, or www.insinkerator.com, but there is no need to search elsewhere, when HC Supplies stocks these incredible taps at such low prices. Purchase the Insinkerator steaming hot water tap for much less than the recommended retail price, and have your new accessory delivered straight to your door as soon as possible. Scroll through our entire collection to discover the beauty of Insinkerator. HC Supplies only stock the most prestigious brands, and Insinkerator certainly falls into that category. We make purchasing Insinkerator taps simple, from the moment you visit our site, until your purchases arrive safe and sound at your door. Once you have selected the taps you want, proceed to purchase and your taps will be with you within 2 to 7 working days. If you require your taps to arrive on a specific date, we can make that happen. Simply call our customer services team after purchase, and we will make sure your items arrive on a day that suits you. This means there is no need to take time off work to stay in and wait for your taps to arrive. Are you refurbishing a home abroad? Great! HC Supplies can ship your new taps to your address overseas. Again, all you need to do is give us a call and will be happy to arrange this for you. 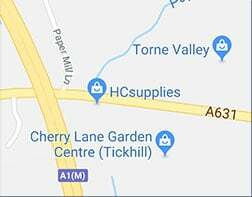 Many of our customers are eager to make use of our fabulous design services, which are available to customers living within 30 miles of our Doncaster showroom. Our dedicated team of design experts will assess your needs and create the perfect kitchen for your home using our stock of big brand items. If you are outside the area, you can still get some great tips from our advisers, or even from our blog which you will find on the HC Supplies website. Should you require any assistance while making your purchase, do contact our friendly advisers who are on hand to guide you through anything you may be having trouble with. We are also available to answer any questions you may have about our products, services, and which items would best suit your kitchen. We have a reputation to maintain, and we are pleased to be able to surpass expectations for all our customers with every transaction. Our products, service and staff are all exceptional, and this includes the drivers we employ to safely transport purchases to your address. Whatever your budget, you will find top brand taps, sinks, and worktops to suit, and each item is guaranteed to be of the best quality, and available at considerably less than the RRP. Our customer service advisers are here to answer any queries you may have, so do give us a call should you have any questions You can also contact us via the online form, and one of our team will be in touch as soon as possible.